OPINIONS OF MATERIALS for reel backing are as multi-flavored as those for rods, and probably for the same reason: different fishing styles will favor one product over another. And it becomes virtually impossible to recommend gel spun over dacron, or Bionic Braid over Spectra or PowerPro gel spun or anything else when you consider the number of products on the market and the expense of accurately testing all their advertised characteristics. There are even some new books out, like Geoff Wilson’s Guide to Rigging Braid, Dacron, and Gelspun Lines (Cardinal Publisher’s Group, April 1999, 42 pages), on the proper ways to rig with all the various product types. Since braided dacron (e.g. Micron) has been with us for a long time, the experimentation going on now centers around gel spun lines, and to help those unfamiliar with this relatively new product, here’s a short review and list of recommendations …. First, a bit of technical info: gel spun lines are made of polyethylene gel, either as braided strands or, alternatively, as fused parallel strands. The lines can also be treated with various lubricants such as silicone and teflon and coated with additional plastics and/or heat treated during the finishing process. DSM High Performance Fibres of Holland invented gel spun polyethylene in the 90s and called it Dyneema. It was licensed to Toyobo in Japan and Allied Signal in the U.S.; Allied gave it the Spectra name. But essentially it’s all the same stuff. 1. Gel spun has a much smaller diameter and increases the capacity of a given reel to hold backing; you can put more than double the amount of backing on the reel and at the same time double the strength of the backing (which is important only because of issues with knots, as described below). 2. Because you can put more, thinner backing on the spool, you can maintain a faster recovery rate on the retrieve if a bunch of line is taken off by the fish; in other words, you effectively have a larger arbor throughout the fight, especially with long-running fish. As well, during a long run drag pressure stays more consistent because the effective spool diameter changes little. 3. There are lots of issues surrounding tying knots in gel spun, most of which hinge on the issue of the material’s high modulus, which translates to brittleness and low stretch. In general, a given knot will weaken gel spun to a much greater extent than it will weaken mono or braided dacron. Gel spun tends to twist while tying and because of its low stretch, knots like the bimini twist are difficult to tie perfectly. Knots tend to suffer fatigue faster than they do in other materials. Finally it seems the fibers can fracture on the impact of knots hitting a guide or rod tip or when pressed against a sharp edge, conceivably the edge of a hole in a ported reel. 4. Abrasion resistance: gel spun is very thin, very slick, very strong material, so abrasion is rarely an issue, although it stands to reason that the higher modulus would make it more susceptible to weakening if it were nicked. 5. 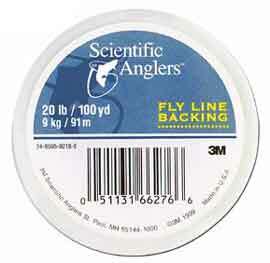 Backing-to-flyline connections are still being perfected, and thinner, stronger gel spun is more likely to cut through a fly line (and a finger) than braided dacron. See the recommendations below for appropriate connection methods. 6. Backing color and situational awareness: apparently gel spun will not hold a dye, but experience shows that some lines, like PowerPro, lose their dyes much faster than others, e.g. Bionic Braid. 7. Because of its smaller diameter, gel spun creates less water drag — something that is especially important in big game fly fishing. 8. Also because of its small diameter and slickness, gel spun needs to be wound onto a spool with a reasonable amount of pressure. Some older fly reels tended to warp with the amount of pressure the additional windings of gel spun put on the spool; but I’ve not been able to find reports of problems with any of the higher-end reels made in recent years. 1. Attach the line to the spool using the Uni-Knot method, or the CA glue method to avoid slippage. 2. Cross wind the backing, both to reduce compression on the spool and avoid side pressure on ported spools, as well as to avoid layer slippage caused by the backing being very slick. 3. Attach the backing to the fly line using a coaxial splice (basically using braided mono as a sleeve and a CA glue as a bond). Retie your connection knots in the gel spun every so often to avoid knot fatigue issues. 4. Because of knot strength issues, if you are replacing 20# dacron, use at least 50# gel spun. If you are replacing #30 dacron, use 65# gel spun or higher. In summary, with due diligence used in attaching it to a fly line, there are some advantages of using gel spun. The foremost, in my opinion, is getting an effectively larger arbor on the retrieve (and giving a normal-arbored reel some of the advertised advantages of a large arbor reel) after a fish has run off a large amount of backing. This same characteristic means that you can use a smaller (and less expensive, and lighter) reel to the same advantage as its larger cousin, assuming the drag system is adequate. Other advantages — like less water drag — can come into play while targeting different species. The same can be said of the potential disadvantage of minimal line stretch while fighting a fish on the backing. Both will be greatly influenced by angling style and the rest of your gear.